I like the comment from a guest at the zoo "See the puppy dog!?" Instead of see the scary pit bull. :) Way to go Max! Just a minor correction to the article. The "City Shelter" is BARC (Bureau of Animal Regulation and Care). They adopt out pit bulls and they are the only shelter in town that has an "all breed" adoption policy. The Houston SPCA is a private organization and they DO NOT adopt out pit bulls. Otherwise a very cute story. It kills me to see the no adopt rule!! Will people ever learn to blame the owner, not the breed?!?!? Way to be an outstanding role model Max!!! 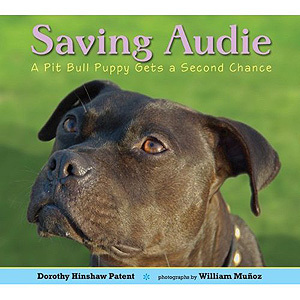 Love this story and love my BARC pittie. The Houston Chronicle labeled him as a mutt when they ran his story - if he'd bitten someone you can bet he would have been a pit bull. The Houston SPCA actually has the nerve to put on their website that they don't kill ADOPTABLE animals. Easy to do if you just label any big, short-haired dog unadoptable based on the fact they look scary. he has a sweet smile! I have volunteered at Houston SPCA. One thing that is not shared here is that admitters are told that pits will be euthanized if left and not claimed by owners (strays). They are absolutely free to turn around and take the dog(s) with them to find other placement. Those who still leave them add that they have been looking for other placement and can't find it. Additionally, I would check out all the other Houston Press articles regarding BARC before you praise them very much. It may help explain a lot. anon, when a shelter refuses to adopt out a certain breed, the message to the public is: "these dogs are not worthy of our help or compassion." what a devastating message to send, and at a time when the dogs need all the help they can get. not having pit bulls on the adoption floor also sends pit bull lovers straight to backyard breeders. we've seen this exact thing happen in our own city, back before SF bay area shelters were adopting out the breed. our population was exploding because - without a good rescue resource - people had no choice but to buy. I'm betting there's a lot of room for improvement at BARC (same as with most shelters), but as pit bull advocates, we support any agency that is at least willing to give the breed a chance. we have to. the dogs are depending on us to speak up for them and that means supporting other groups that are trying to do the right thing. What a great story. I am a FONZ (friend of the National Zoo here in DC) and we are building an Asian trail for our "baby" elephant. Maybe they would like a pit bull, too? As far as dogs being PTS, people should check out each shelter's policy. Not naming names, and not the one where I volunteer, but some shelters will put down an owner surrender within 72 hours as "unadoptable". LOVE the picture of him in the box!! That's a big ol', full on, pit bull clown grin if I ever saw one. Looks like he is enjoying life ... as he should! Bonnie...LOVE your comment! You are so right! Glad you were able to save another pit. They are definitely worth every bit of love and respect that we would give any other animal! Donna...what a great post! I particularly enjoyed your last comment. No shelter situation is perfect but there are so many out there that are trying and doing whatever they can to save innocent animals and they deserve our support. Thank you both and as always, thank you BAD RAP for keeping us informed! I had no idea the HSPCA didn't adopt out pits. Mine was born at BARC, so I simply assumed the HSPCA wouldn't be so insensible. Just want to praise your awesome blogspot. Although the site is dedicated to APBT's, your stories and education on all "pits" is terrific. 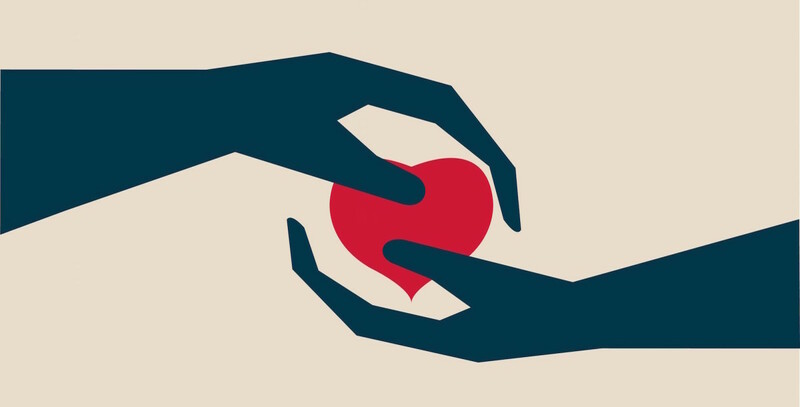 Going to add your link to my "Love Is The Pits" (http://www.head-to-tail.com/love.html) page. Kudos. Clearly the elephants and their caretakers know a good thing when they see it. Good for you little Max! Someone give that boy a lifetime supply of cookies!! That video is just more positive proof about what an awesome breed our little pits are!!!! 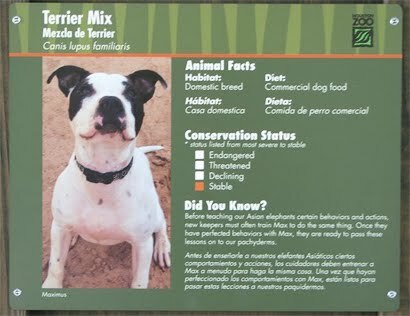 They should correct his ID card on the window at the zoo to read: Conservation status THREATENED...considering how many people and agencies are working to exterminate every last pit bull. and listing him AS a APBT or AmStaff rather than "terrier mix" (although I fully understand why they did it that way) would go far in showing all the people coming to see the elephants, and seeing what a great dog Max is, that 'pit bulls' aren't scary, demonic creatures after all...just big, tough, happy dogs with goofy grins and can-do attitudes. I would sure love to get a print of that sweet boy in a box to hang on my wall. What a monkey! Love it! Go Houston Zoo, and Max! Hopefully the Houston SPCA will learn a thing or two. ...Wish I could hang with elephants all day. for trying too help pits too. While they adopt out, remember to get to the shelter early as Pits kept at the shelter for 3 days then into the tomb w/o a rescue. A lot of people came together to pull my kennelmate Joey-Reno and get him to my folks to heal him up from a knife wound. Yep, County is trying hard but struggling with controlling animal abuse. Dig into their efforts you find postings on their "Snip a Pit Program" and their "Tricks for Pits Program " (The program, ran in the summer '09, offered FREE veterinary health checks/vaccinations, dog training equipment, 8 weekly dog training classes, and graduation certificates. 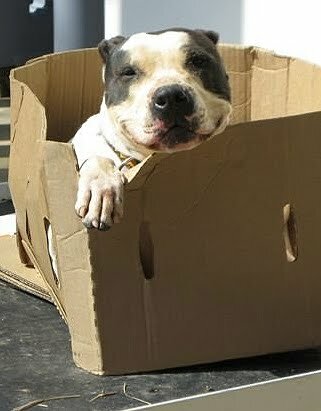 ONLY for Youths who own pit bull dogs.."). So those in the area, help promote and support these great embryonic programs in our COUNTY (read city and country outside of Houston city limits). Look also for news on new groups in the area trying to help the county in the "Corridor of Cruelty" to reduce abuse and increase adoptions. I used to live in Houston and am shocked to hear about their no adopt policy! Shocked and sad. That settles it. We're going to the Houston Zoo at our first opportunity! 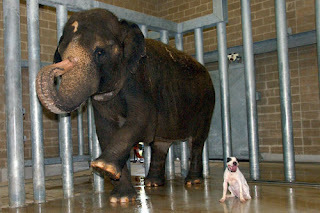 Three cheers to the elephant staff and their "terrier" Max. Boris - when did Harris County change their policy. I found an adorable young pittie there last year that was on his three day hold and was told by the staff that I couldn't adopt him b/c they don't adopt out pits. =( I cried that night, a beautiful sweet dog dead b/c they wouldn't let me have him. Love it! What a good boy. And he must have a blast, interacting with people who keep him around to essentially study his behavior. I can't think of a better gig for a pit bull, constantly "talking" to people who are always trying to improve their communication with him on his terms. But I wish they were listed as "over-populated" rather than "stable." Sorry to not fully understand or state the HCPHES Veterinary Public Health Shelter policy. A rescue group saved our JR. He could only be placed into a rescue group that was recognized by HCPHES Veterinary Public Health (a Huskey rescue at that). It took place right as his three day hold expired. Which Animals Can be Adopted? While we would like to be able to find homes for all the animals in our facility, there are certain guidelines that we must follow. Please Call (281) 999-3191 with any questions about our adoption policies or guidelines. •The animals must stay here for a minimum of 3 days to allow the rightful owners time to locate them. •The animals must show NO signs of aggression while in our care. •The animals must be medically suitable for spay/neuter surgery. If they tell you on the phone that they don't adopt out pitbulls than either their online statement is wrong or ALL pitbulls violate one of their three tennents. They are trying to put pitbull informaton and links on their web. Donna, you are just a compendium of the very interesting!! And your writing is fabulous! PB's everywhere are so lucky to have such a smart thinker/writer as one of their committed advocates. You find such great ways to come at their stories from every angle. This is an adorable story, which of course also includes some important info. LOVE you and all that you guys at Bad Rap do. BAD RAP is so awesome. Your site is the reading material I assign to people who want to adopt PB's from me. After they've read, we discuss. If they can't be bothered to read some, well then I can't be bothered to adopt to them. I do love the pitbull aspect of this story, but I think we all need to remember that zoos are horrific places for elephants. Other animals are no more or less deserving of kindness and dignity than dogs, and I think sometimes dog-lovers forget that. We should not be supporting the captivity and confinement of any species. The worst part about the SPCA policy is that they're not open about it. I appreciate that they are a private organization and are entitled to set their own policy--I actually don't take in pit bulls a foster dogs myself, for a variety of reasons (mostly housing-related). But at least I'm open and honest about it. The Houston SPCA's website and FAQ sections state that they adopt-out all "adoptable" dogs, and then further specify that they adopt out those dogs without behavior/violence problems or health problems. Nowhere do they say that they have breed restrictions and when I emailed them for clarification earlier this month, I never got a reply. I'm happy to hear that they at least tell the folks relinquishing their dogs about their policy, but I would have much more respect for them if they were open and honest about it in their communications to potential donors and go the general public. What's wrong with a little transparency? You're very kind Madalin. I just report what i see, and thankfully, there never seems to be a shortage of great material with the number of amazing dogs and loving dog owners out there. I wish they were listed as "over-populated" rather than "stable." from experience, pit bulls are one of the most loving breeds I've owned. They are loyal and yes, protective of their home and their people. We used to say our girl was saying "my house, my yard, my people, my car, my friends" she welcomed all that we welcomed and challenged all we didn't. It's too bad this breed gets such a bad rap. I think there are no bad dogs only bad owners.